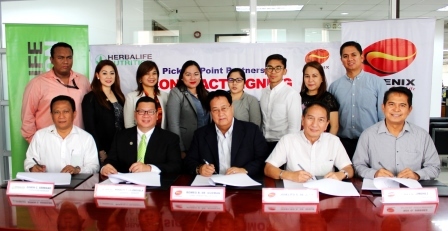 Herbalife Philippines, part of the global nutrition company Herbalife, announced a strategic partnership with Phoenix Petroleum Philippines to make it more convenient for Herbalife Independent Members and customers to access its nutrition products. Under the arrangement, Herbalife members and customers will be able to pick up Herbalife products that they’ve ordered from the company at Phoenix retail stations across the country. This pilot program with Phoenix Petroleum Philippines is a significant milestone in the company’s commitment to sustainable expansion in line with its business growth in the country. The agreement, and the recent opening of Herbalife’s Quick Response Center in Cebu City, is part of Herbalife’s plan to increase its product access and availability in the Philippines where a recent survey showed weight gain is the top concern of 84 percent of the population. Phoenix Petroleum Philippines has built an extensive network throughout the country with almost 450 stations and is currently refurbishing existing stations and building new large ones to provide more products to their customers. It was named as the 2015 Outstanding Filipino Franchise in the large-store retail category by the Philippine Franchise Association. The company has over 8,000 employees worldwide, and its shares are traded on the New York Stock Exchange (NYSE: HLF) with net sales of US$4.5 billion in 2015. The Herbalife website contains a significant amount of financial and other information about the company at http://ir.Herbalife.com. The company encourages investors to visit its website from time to time, as information is updated and new information in posted. To learn more, visit Herbalife.com or IAmHerbalife.com.